Want to work 26 percent faster? Sabre Red 360 will show you how. From new routings to restrictive fares to bundled hotel rates, travel suppliers continue to differentiate their products, and travelers are looking to the professionals for help navigating an increasingly overwhelming marketplace. 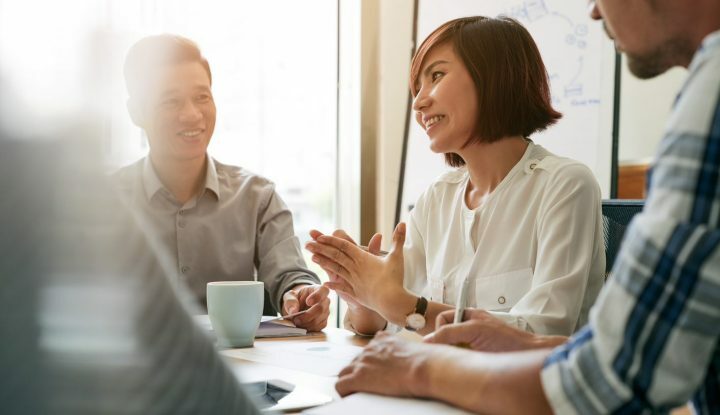 Today’s travel consultant is expected to master new offerings, offer personalized service, and habitually increase revenue. Consumer travel sites guide travelers step-by-step through the booking process, presenting optional add-ons and upgrades throughout. Our newest booking tool, Sabre Red 360, features the same step-by-step graphical booking process as consumer sites but is specifically designed for the travel professional. No matter how intuitive, a graphical interface cannot solely replace expertise. However, in the hands of a travel professional, an intelligently designed point-of-sale is an invaluable tool for decoding marketplace complexity. 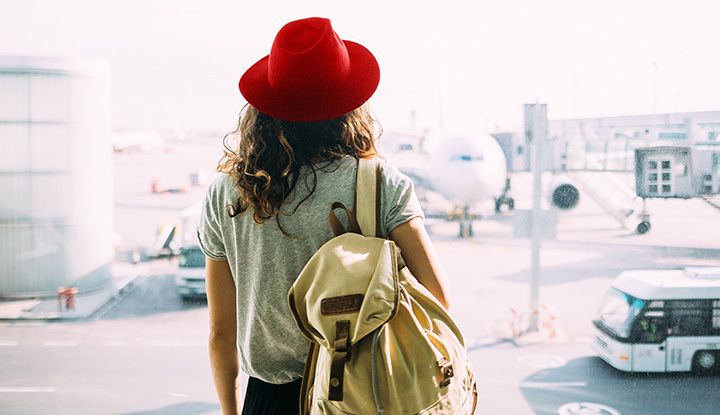 In a recent lab study, Sabre experts stepped into the role of the travel consultant, aiming to test the efficiency of Sabre Red 360 regardless of the skill level of the travel consultant. Based on recent visits to real travel agencies, our Agency Consulting team created a test scenario designed to mimic the conditions of a fast-paced selling environment: the travel agency call center. A frequent business traveler, “Diane,” called her travel consultant seeking to book a roundtrip flight from Dallas-Ft. Worth to London-Heathrow on Feb. 11 through Feb. 15. 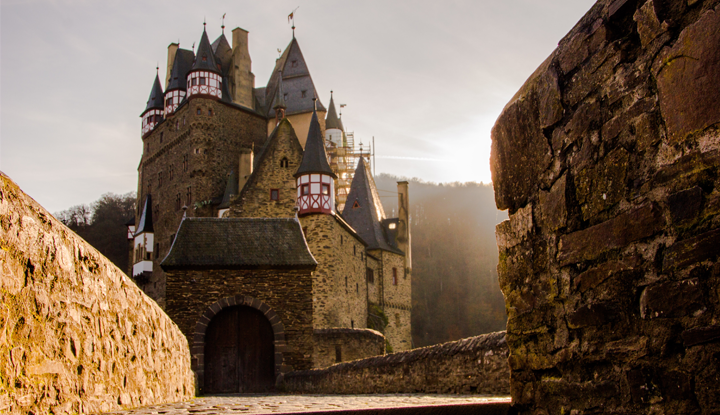 In our simulated agency, Diane’s travel preference information is saved in a Sabre Profile and includes her choices for air (American Airlines and WestJet), hotel (Hyatt and Hilton), and car (Hertz and Avis). Throughout the conversation, Diane requests a flight booking, followed by a hotel booking and a car booking. However, after all travel is reserved, Diane requests additional information. First, she requests options for flights to London leaving out of nearby Dallas Love Field airport, which is closer to her home. Next, Diane remembers she has an important personal engagement during the original travel dates, so she requests to move the entire trip up a week. John, a 20+ year Sabre veteran highly proficient with native formats, completes the full scenario in Sabre Red Workspace. When Diane makes the initial call, he quickly records the details of her request in a notebook. First, he references Diane’s Sabre Profile to see if she has any preferred carriers on file and writes down her preferences. After moving the profile into the record, John proceeds to book the DFW-LHR flights within seconds through an Air Availability path. Next, Diane requests a hotel, and after a few exchanges back and forth determining where in the city she would like to stay, they pick a property near the city center. To reserve a car for Diane’s commute outside the city, John displays the PNR to retrieve the flight itinerary information, quickly writes down arrival and departure times, and books a car with Hertz. All of this is done in under 10 minutes. With all travel reserved, Diane then requests to compare options flying out of Dallas Love Field airport. John initiates a new Air Availability search and presents the new options to Diane, who ultimately decides to keep the original flights. Just as the phone interaction was concluding, Diane realizes she will be gone for Valentine’s Day with her husband, and requests John rebook the trip for the week prior. John must start from scratch to search, quote, and book the air, hotel, and car reservations. After the travel is re-booked, the call is finally finished, and Diane hangs up satisfied with her service. Jane, with two years of Sabre experience, completed the full scenario using only the graphical styling of Sabre Red 360. After receiving Diane’s call, Jane immediately sets to work leveraging the tools at hand. 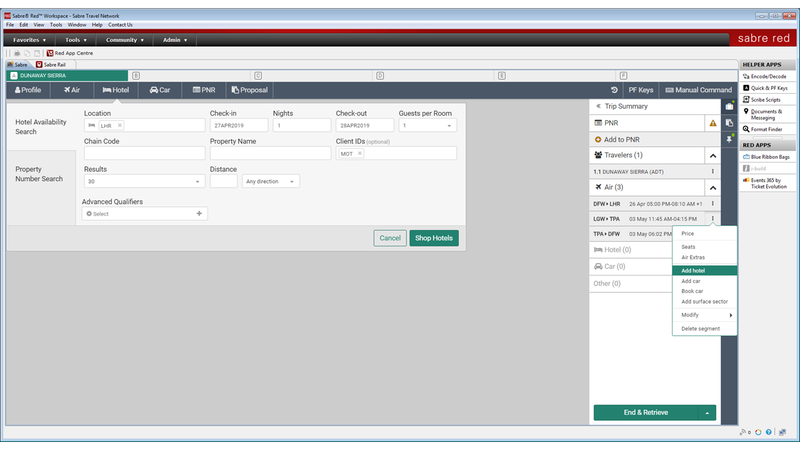 Instead of relying on a notebook or memory, Jane is able to copy over Diane’s Sabre Profile and see preference information automatically loaded into the search. 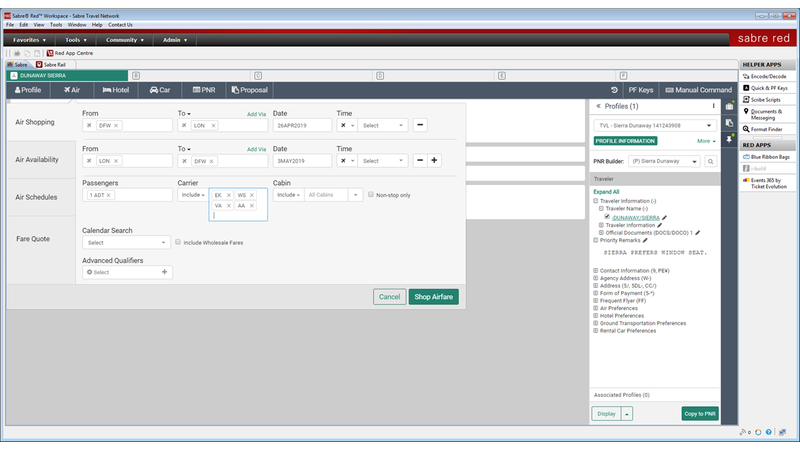 Next, she uses the graphical Command Helper form to shop for air, and all the details of the search are stored in Command History for later reference. The intuitive Air Shopping form prompts Jane to proactively ask Diane details about her ideal flight schedule, which helps her personalize the search to Diane’s preferences. Upon receiving a response, Jane books the lowest priced option available and proceeds to search for a hotel. From Trip Summary, Jane uses a shortcut to add a hotel, which pre-populates the dates and location into the Command Helper hotel shopping form. Rather than search for a hotel near the airport, Jane enters “London” as a point-of-interest in the search to get options closer to downtown. She pulls up an interactive map with included preference data to share available options downtown, and they settle on a Hilton location right near Big Ben. To book a car, Jane leans on Trip Summary once again, which pre-populates the car shopping form with arrival and departure dates and times from the flight itinerary. She books a car with Hertz, after referencing the icon in the response indicating Hertz is one of Diane’s preferred car vendors. All of this is done in about nine minutes. When Jane is asked for options out of Dallas Love Field, she takes another shortcut and uses Command History to pull up an Air Shopping form pre-populated with the original air search. Jane simply swaps out “DFW” for “DAL” and re-executes the search. Within 30 seconds, Diane has been informed of the options out of the new airport and decides to stick with the original reservation. As with John, Diane again asks Jane to move the trip up a week to be in town for Valentine’s Day with her husband. This time, Jane leverages the Decision Support Bar to provide Diane with useful information about flight options a week prior and adjust the travel dates. Once Diane picks a flight, Jane sells and saves the price in one step and is prompted to display the Graphical PNR, where she can then quickly adjust the hotel and car dates from the Itinerary tab. Even with less Sabre format experience, Jane completed the same scenario 26% faster using Sabre Red 360. How did a consultant relatively new to the industry save so much time? The difference is in the design. Both John and Jane have learned the business of travel throughout their tenure, and both professionals were able to provide Diane with satisfactory service. 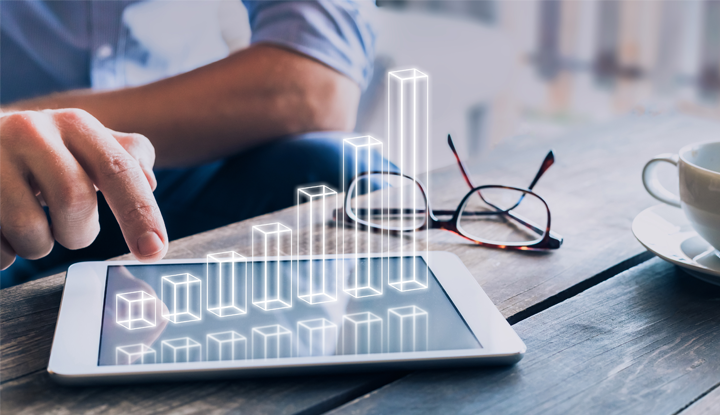 However, Jane was able to leverage pre-populated Sabre Profiles data, advanced insights, and shortcut tools that ultimately helped her speed up the workflow. Sabre Red 360 takes away the need to type extra commands or remember obscure qualifiers to keep up with traveler demands, so travel consultants can focus on what they do best — consulting. Imagine if someone with 20-plus years’ experience had access to the same efficiency tools. 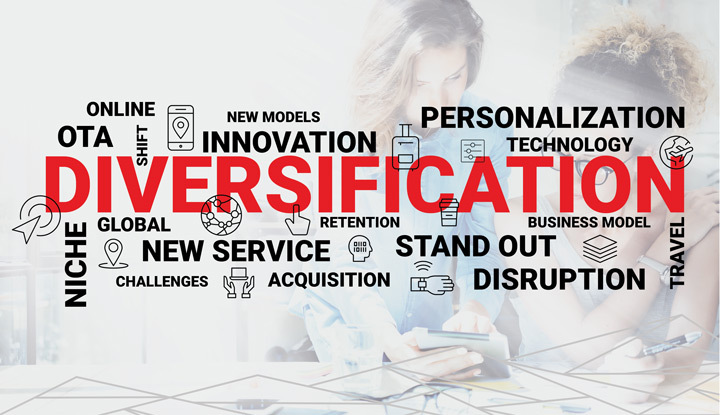 After all, Sabre Red 360 is only as powerful as the user, and someone with so many years of industry knowledge is the most equipped to leverage the full spectrum of options and insights to provide a differentiated level of service. 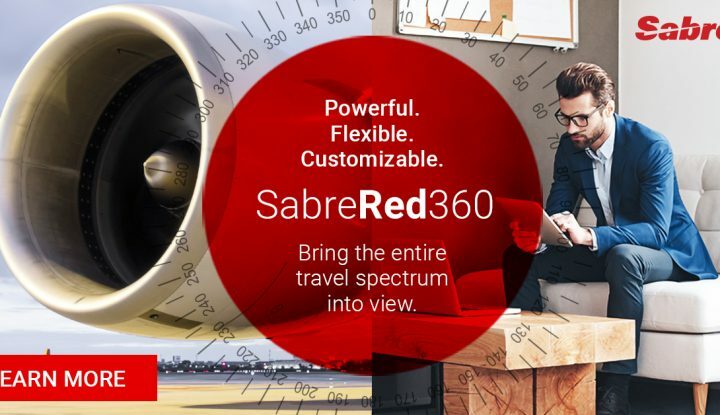 Sabre Red 360 is different by design and is uniquely positioned to help the travel consultant exceed their traveler’s expectations while enabling faster service. 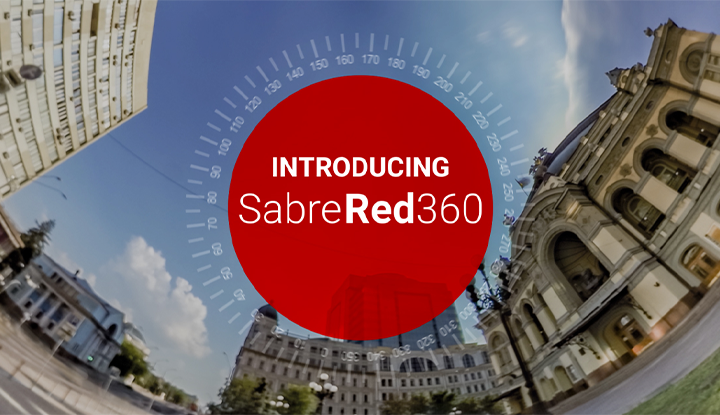 Get the full spectrum of content and insights by upgrading to Sabre Red 360 today. 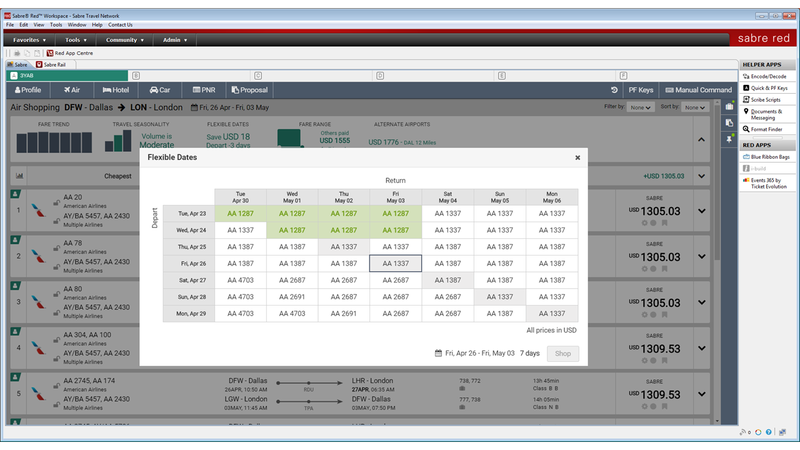 Schedule your 360 demo today and see how you can get 26 percent faster when you book with Sabre Red 360. Sierra Dunaway leads Sabre Travel Network's Global Product Marketing team.